If we only could tell what our own individual futures will hold, we’d all likely make decisions based on the information we had to alter the outcome in a more desirable way…well last week Veeam held their annual Availability Conference, VeeamON 2017 in New Orleans. The event was full of many future product announcements providing the technology community with the direction that the company is headed giving everyone the ability to properly prepare for the next versions of the Veeam product set. The most requested feature that’s been received by Veeam RD was around the ability for native Veeam Linux and Windows agent management through the Backup & Replication console. Well, yup you guessed it (probably could tell by the title of the blog post too) Veeam formally announced that Backup & Replication v10 will add complete agent management for both of the agent products, Veeam Agent for Linux and Veeam Agent for Microsoft Windows. I had the opportunity to demo an early build of v10 live as part of the main stage General Session – I wanted to share the details with everyone as this is the most anticipated feature of v10. There have been many areas within the Backup & Replication (B&R) user interface that’s been updated. The first I’ll point out is the Inventory Section – if you’re familiar with the B&R console you realize that this was previously the VMs area. The interesting piece about this change is the fact that no longer are you managing just VMs – its all about the cross cloud management story which includes all of the workstations and physical servers residing in the environment. In my opinion, the most common discovery method will be the Active Directory method, lets take a look. 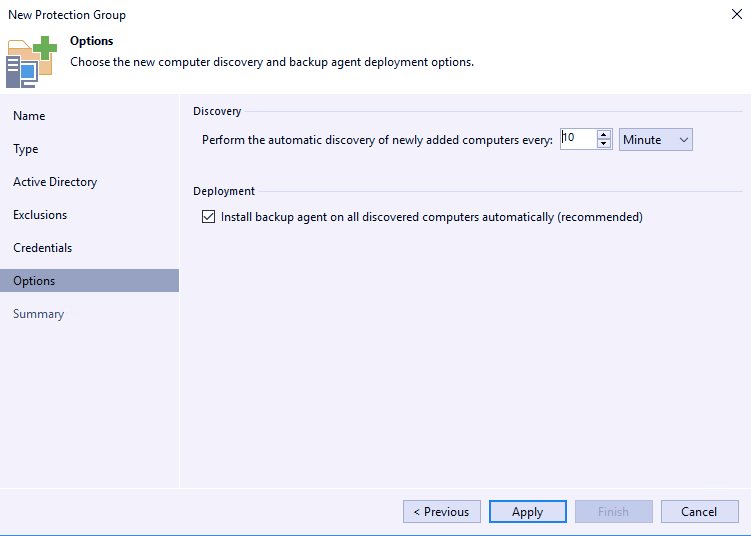 When you choose the Active Directory discovery method, Veeam Backup & Replication will automatically attach to the Active Directory structure of the domain that your Veeam server is a member of – if required you can change to an alternate or child domain in the environment. Veeam allows you to choose an the entire domain or an individual domain object for the discovery. Administrators can exclude objects from the discovery. For instance, virtual machines that are already being protected by Veeam Backup & Replication do not need to be protected thus they don’t require the backup agent. Computer accounts that have been offline for 30 days or greater can be excluded as well. Lastly, you will be able to statically assigning an entire organizational unit or an individual computer object from being discovered. Service account here used to perform the Veeam Agent deployment – If required each object can have individual Administrator accounts specified – perhaps each locations machines are logically separated in a child domain or in different OU’s – You as an administrator can specify the necessary credentials. 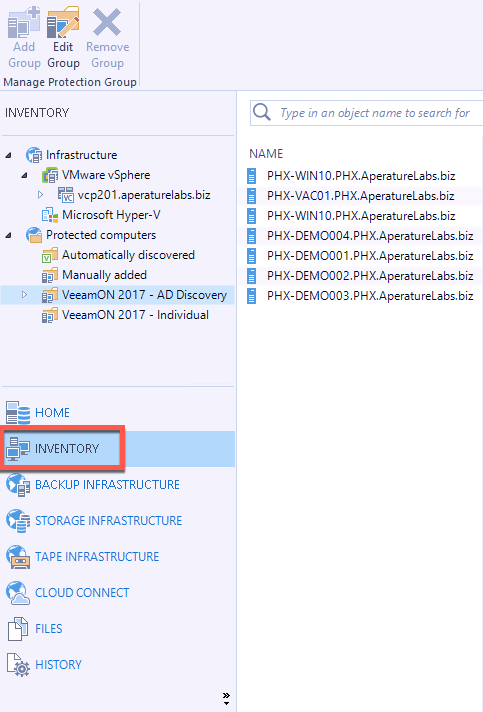 The last step in the AD Discovery is to define the discovery frequency in minutes, hours or days as well as whether or not the Veeam Agent should be installed automatically as each object is discovered. Veeam Backup & Replication will become the centralized deployment of the agents and deploy the software as scheduled. There are 2 pre-created Protection Groups that will ship with the product – Automatically Discovered and Manually Added. Manually Added Protection Groups will be populated when computers are added via the backup job wizard. 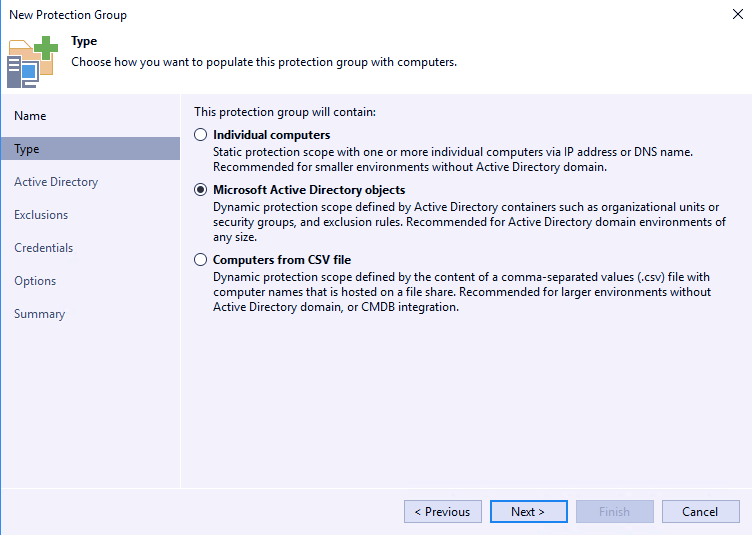 The Automatically Discovered protection group will be populated when IT (optional) deploys the Veeam Agent and the corresponding configuration via software deployment tools like System Center Configuration Manager or through another software deployment tool. Now that we have our inventory we’re able to protect those devices. To do this you can right click on the Protection Group and add to an existing agent job or create a new one. There are 3 different job types: Workstation, Server and by popular demand, Veeam Backup & Replication and Veeam Agent for Windows will fully support Windows Failover Clusters! There are 2 distinctly different Agent Mode options available. 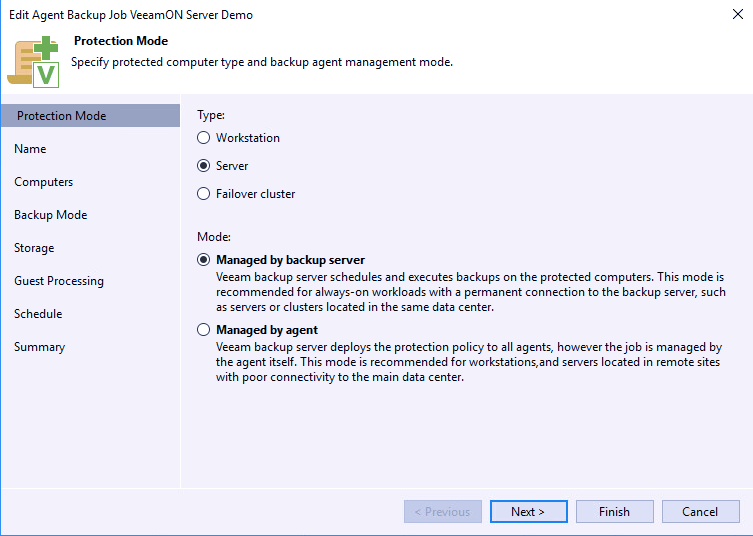 The first is option allows the Veeam Agent to be completely managed by Veeam Backup & Replication. This means that all aspects of the job are managed through B&R including viewing agent job statistics, job processing information as well as the ability to remotely start and stop your Veeam Agent jobs. This is ideal and the recommended method for devices that are always connected to the corporate network, like servers or workstations. This method will deploy a lightweight UI-less version of the Veeam Agent where zero aspects of the configuration will be adjustable on the actual agent itself. There is no UI and no database information stored locally – everything is managed by B&R. The second option is Agent Managed. This option will install the full Veeam Agent experience on the computer device and is the recommended configuration method for devices that are frequently disconnected from the corporate network and still require that their RPO is met. All of the job scheduling and processing is done locally making the support for ANY repository type to be available for the for Agent Managed option. For transactional applications that require application consistency and crash consistent is not ideal – specifically Veeam supports SQL Server including Always-On Groups, Oracle, Exchange including DAG configurations, Active Directory or SharePoint – these specific applications will be able to fully leverage the Veeam Explorers for the quick recovery of individual item level recovery. For SQL and Oracle users will be able to perform transaction log backups allowing for point in time recovery just like B&R. The last point that I’ll provide you with is related to the Recovery Media and how it is created. When the agents are managed through B&R the Recovery Media is automatically created and stored within your target repository for quick bare metal recovery when needed. VeeamON 2017 was full of huge announcements, native Agent Management within Backup & Replication v10 is likely to be the biggest one!